ROBINSON, PETER, office holder, businessman, fur trader, militia officer, politician, and jp; b. 1785 in New Brunswick, eldest son of Christopher Robinson* and Esther Sayre; brother of John Beverley* and William Benjamin*; he had at least a son and two daughters; d. 8 July 1838 in Toronto. Peter Robinson spent his childhood on the move. He was in New Brunswick for three years, in Lower Canada for four, and in Kingston, Upper Canada, for six before his family settled in York (Toronto) in 1798, the year his father died. As a loyalist and surveyor general of woods and forests, Christopher Robinson left his wife and six children an established place in York society. Unfortunately, he left little means to sustain it, and in 1800, at 15, Peter was given a position as clerk of the Home District Court of Requests. Esther Robinson’s second marriage, in 1802 to Elisha Beman*, a York merchant and land speculator who soon settled at the site of Newmarket, introduced Peter to a different way of life and to the business career he would follow until 1822. In 1812 Robinson, who had moved to Newmarket, acquired a mill there, the first of the several he and his brothers bought or built for lease, and in 1814 he began buying lots north of the village. Over the next 18 years he acquired eight lots on Yonge Street, including the site of the village of Holland Landing, which developed around a mill built by Robinson. He invested in numerous other enterprises: an inn, a schooner on Lake Simcoe, a distillery, and farms, but his greatest personal involvement was as a fur trader employing agents in the back country and as a merchant supplying the trade. Although the portion of this trade falling to Yonge Street traders was small, Robinson shared in the temporary prosperity brought by the War of 1812 to the Lake Simcoe route to the upper Great Lakes. By the mid 1820s Robinson Brothers was active on the French River. In total, Peter’s various enterprises yielded him a comfortable income which by 1824 exceeded his personal needs. At the start of the war, Robinson had raised a rifle company, attached to the 1st York Militia. This company, made up of experienced woodsmen, travelled overland to join in Major-General Isaac Brock*’s successful attack on Detroit in August 1812. Robinson was one of 13 captains in York when that town surrendered to the Americans in April 1813. The following year he put his backwoods knowledge to use again in helping Fort Michilimackinac maintain communications with York during the American blockade of Mackinac Island (Mich.). Robinson opened two apparently short-lived stores in York, one in partnership with his brother-in-law D’Arcy Boulton Jr in 1810, the other in 1820. 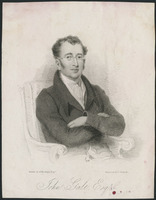 After his election to the House of Assembly for York East in 1816 and, with William Warren Baldwin, for York and Simcoe in 1820, he spent more of each year in York. A staunch government supporter, he chaired a committee on St Lawrence River navigation and reported on the repair and construction of the parliament buildings. In 1818 he received his first commission of the peace for the Home District. Five years later he became a director of the newly formed Bank of Upper Canada. The three Robinson brothers took a close interest in one another’s welfare and participated in joint investments; Peter and William were associated in business. Over the years John, who had a home, a family, and a prominent position in government, increasingly assumed the role of head of the family, although Peter rarely went so far as to take the good advice he frequently offered. Peter was able to offer John money in the event that he decided to try to establish himself in England, but it was John who obtained for Peter the interview that led to a new career. In 1822, with John and his wife, Peter went to England for the first time, as a tourist. 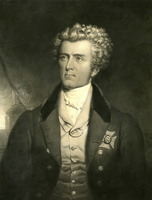 Early the following year John introduced him as an expert on backwoods settlement to his friend Robert John Wilmot-Horton, the new under-secretary of state for the colonies. An enthusiastic Malthusian, Wilmot-Horton had a scheme to bring peace and prosperity to Ireland through the sponsored emigration of thousands of dispossessed tenant farmers whose continued presence blocked agricultural improvement. He had obtained the government’s consent to a small-scale, experimental scheme for sending emigrants to Upper Canada, and he found his superintendent in Peter Robinson. Wilmot-Horton deliberately introduced his scheme in the Blackwater River valley of County Cork, a region where there was no tradition of emigration and where the Insurrection Act was in force. He sent Robinson there in the spring of three successive years. If nothing else, Robinson proved for Wilmot-Horton what a single personable interviewer with a few key introductions could accomplish. On his first visit to the Blackwater valley, Robinson found that there were many who were willing to equate assisted immigration with transportation. Two years later, the would-be immigrants needed sponsorship even to get on a list. Robinson was besieged by applicants at every town and wrote in terms of 50,000 vying for 2,000 places. At the completion of the difficult task of selection in 1825, he was satisfied that his candidates were “a better description of people than those taken out in 23 altho’ they are wretchedly poor” – poverty being one of Wilmot-Horton’s firm pre-conditions. In 1823 Robinson sailed from Cork with 568 individuals, bound for the military and Lanark settlements in the Bathurst District of Upper Canada. A second immigration was postponed in 1824, but in 1825 Robinson took 2,024 immigrants to the Newcastle District. In the context of his circle at York, Peter appeared unusually tolerant of his Roman Catholic charges, in striking contrast to his brother John. 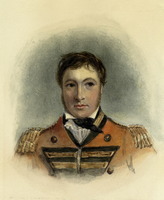 The members of Lieutenant Governor Sir Peregrine Maitland*’s administration supported the settlements for Peter’s sake and because of Wilmot-Horton’s interest and instructions, but they held to the belief that Irish Roman Catholics were the least desirable of British settlers Robinson’s 1823 immigrants were therefore watched with nervous anticipation. Although a few failed to adjust to settlement among Irish and Scots Protestants, as a group they were involved in only one incident, in May 1824, serious enough to attract more than local attention. Colonel James FitzGibbon* went to mediate and the government continued its support, but Robinson’s 1825 settlers were to be located off by themselves. The one-time parliamentary grants for the larger and more ambitious immigration of 1825 produced difficulty for Robinson’s management of the operation. The grants were made late in the spring, so late that he arrived in Upper Canada after the settlers. It had been impossible to make the advance preparations which might have cut costs. Hindsight suggested that a depot should have been established, and the work of opening a settlement begun, during the previous winter, the customary season for transporting bulk supplies by sleigh and chopping a first clearing. There had been no funds and no authority for this work. For the same reason, the ships’ surgeons who conducted the immigrants up the St Lawrence had to make do with existing facilities. Robinson’s organization was greatly criticized for holding the immigrants in an improvised tent city at Kingston until his arrival in August; but this action had been taken on Maitland’s orders. Once at Kingston, Robinson moved his settlers forward to the Newcastle District and onto the lots he chose for them with an energy and resourcefulness that showed him at his best. In 1823 William Marshall, his second in command, had criticized his indulgence. In 1825 Robinson declared that he intended to be stricter at Scott’s Mills, the depot for the distribution of supplies. 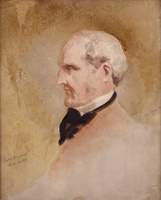 In fact, order within the settlement depended on good will and on his personal authority over the immigrants, and he continued to seek to “gain them by kindness.” George Hume Reade, their doctor in 1825 and a more sympathetic observer than Marshall, singled out for particular praise Robinson’s “kind manner” and “upright principle” in his handling of “the lower class of the Irish.” Robinson liked his job and had no doubt in 1824 that he preferred working with Wilmot-Horton to the possibility held out by John Galt of superintending the sale of the crown lands of Upper Canada in the future Canada Company. In the sparsely settled townships of the Newcastle District to the north of Rice Lake, the 1825 immigrants were certain of a welcome from the inhabitants and of a good choice of crown land. But they faced a long, difficult journey in an unusually hot summer. The heat aggravated both the fever and ague contracted locally and the endemic illnesses that the immigrants brought with them. Robinson himself developed a fever from which he “never perfectly recovered,” and most of his assistants were also sick over the course of the summer and fall. At Scott’s Mills a town-site was surveyed by Richard Birdsall* in 1825 and named for Robinson. The community which grew up around the depot contained grist- and sawmills built with government funds and became the hub of a rudimentary road system. Many Upper Canadians would have spent the money differently, but most could agree that the Peterborough immigration had successfully pioneered a new region. Robinson is still best remembered as the founder of Peterborough. Robinson had left the 1823 immigrants as soon as they were located. He stayed with the 1825 settlers until March 1826, when he completed a personal inspection of all lots and a report of improvements. In all, he had located just under 2,000 immigrants in nine townships in the Newcastle District. Not all locations had been taken up and some remained temporarily vacant as families regrouped to begin work on a single lot, but still the totals of land cleared and of produce raised, which Robinson sent off to Wilmot-Horton, were signs of a flourishing settlement. 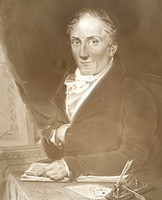 Robinson’s stock was high in the Colonial Office when he returned to England in 1826 and 1827 to give evidence to two select committees on emigration called at Wilmot-Horton’s instigation. Wilmot-Horton’s scheme, in its Irish formulation, proved too expensive to win the sponsorship of government or landlord. 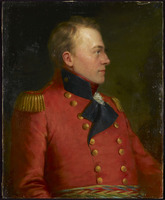 Although he recognized his failure in Britain, he sought to provide for the continuation of some elements of his scheme in Upper Canada after his resignation in January 1828. 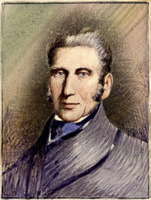 Before he left office, he had Robinson appointed, in July 1827, commissioner of crown lands (Upper Canada’s first) and surveyor general of woods. The Crown Lands Department was created to oversee the implementation of a new policy for the sale of crown properties, including disposal by auction and payment by instalment which, Wilmot-Horton believed, would allow indigent immigrants to acquire land. In November Robinson took on the added duty of commissioner for the clergy reserves. These appointments gave him a place he had not had before in the inner circle of government, first as a member of the Executive Council and in 1829 on the Legislative Council. The only significant public revenues Robinson collected as surveyor of woods were timber duties in the Ottawa valley, which were handled by a clerk and by agents [see Charles Shirreff]. Most of his time was devoted to administering the sale of crown and clergy reserves and, to a degree that could not have been predicted from his instructions, assisting immigrant settlers. 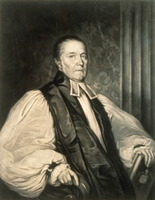 Although he was never one of the principal players in the controversy surrounding the clergy reserves, Robinson, as commissioner, determined the spirit in which the imperial Clergy Reserves Sales Act of 1827 would be implemented. This act allowed the alienation of up to one-quarter of the reserves at a specified annual rate and most of this land was either sold or leased by the time Robinson left office in 1836. Clergy lots could be paid for in easy instalments over a number of years, terms reminiscent of those proposed in Wilmot-Horton’s emigration committees. Robinson was generous in his interpretation of the rules, particularly in allowing conversion from lease to freehold. His system was open to abuse, but it put ownership within the reach of many settlers, and enabled others, including a number of those who had come with him in 1823 and 1825, to provide for their children close to home. Robinson’s tenure in the Crown Lands Department was shaped by a dramatic rise in immigration from the British Isles which peaked in 1832, the year of a cholera epidemic. Contemporary statistics for emigration to British North America are understated and unreliable, but they reflect reality. Figures of 12,000–13,000 for 1826–29 rose through 30,000 in 1830 to 58,000 in 1831 and 66,000 a year later, dropping to 28,000 in 1833. Each year a proportion of the immigrants arriving in Upper Canada failed to fit into the province’s economy. They could not find work and lacked the capital to establish themselves by their own efforts. 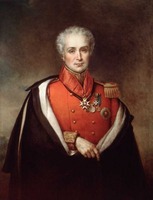 Lieutenant Governor Sir John Colborne*, who replaced Maitland in 1828, turned to Robinson to use his expertise and the resources of his department to provide for indigent immigrants. In addition to agents responsible for a port, road project, or settlement, Robinson employed others on a casual basis as particular needs arose. Agents in the lake ports directed needy immigrants to their colleagues inland who, at specified places, offered work, usually the opening of roads, and 50-acre lots on extended terms. The program got off to a modest start in 1829 in Ops Township, in the Newcastle District, and expanded rapidly in 1831–32. The Ops experiment was supervised by Alexander McDonell*, Robinson’s most active assistant in his 1825 settlement, who had been rewarded with a crown lands agency in 1827. His accounts for “subsisting, locating and employing” immigrants in the Peterborough area between May 1831 and April 1833 indicate settlement in 11 townships. Advertisements in 1832 directed indigent settlers also to John McNaughton in the Bathurst District for crown lands in Ross, Pembroke, and Westmeath townships, and to Wellesley Richey in the Home District for land in Sunnidale, Oro, Medonte, and Orillia. In the Western District, Roswell Mount* assisted settlers in Adelaide and Warwick. All Robinson’s agents had wide spending powers. The instructions of Colonial Secretary Lord Goderich to Colborne stressed self-help – employment for the immigrants rather than the direct aid which Wilmot-Horton had given. Recent immigrants had not proved efficient at clearing and chopping, however, and Robinson and his agents were caught between these orders and the pressing needs of families who were in their care because they had no other recourse. Much depended on the experience and discretion of the agents, for Robinson issued orders requiring prior approval of new expenses only in May 1833. The severest test came in summer 1832 when Upper Canada’s first cholera victims were identified. Colborne based his strategy on the belief that the greatest danger lay in allowing large numbers of immigrants to congregate in temporary quarters. Top priority in 1832 went to moving immigrants out of York and the other towns along their route. Robinson’s network held up under this pressure despite the difficulties caused by fear of infection. Charges for transportation rose and in some communities all doors were closed to strangers. Yet even Roswell Mount, at the distant end of the chain, got his people placed and in some shape for winter. The epidemic did not lead to civil disorder and families did not starve in the new settlements. In midsummer 1832 Robinson began to see what the cost of this achievement would be. His policy, as in the 1820s, was always to get immigrants settled and to worry about accounts only after the end of the short season in which they could be located successfully. His effort indeed proved so costly that it destroyed his operation rather than brought it credit. Robinson was sick in August and Colborne involved himself increasingly in ordering retrenchments. As winter arrived, with more and larger bills, it became clear that some agents, Mount being the most notorious, had lost control of their spending. After Colborne had added related expenses, such as grants for district hospitals, the total he reported to Colonial Secretary Stanley in September 1833 was £13,286, more than twice the £5,000 allocated for immigrant needs in 1832–33. Colborne defended himself stoutly, but Wilmot-Horton’s successors in the Colonial Office were unsympathetic to assisting settlement and they now sought to end the practice. 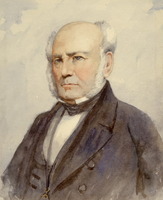 In 1836 Robinson participated as a councillor in two events that led to major controversies. Just before he left Upper Canada in January, Colborne had endowed 44 Anglican rectories with land, an action that infuriated the reformers. It was Robinson and two fellow councillors, Joseph Wells* and George Herchmer Markland*, who had approved the patents. In March, Robinson was one of the expanded council of six members who resigned to protest Lieutenant Governor Sir Francis Bond Head*’s treatment of the council. Although Robinson was the presiding member, it is unlikely that he had the health or ambition to do more than follow advice, either in resigning (at the urging of Robert Baldwin* and John Rolph*) or in offering, with Wells, Markland, and John Henry Dunn*, to withdraw his resignation. Head refused the offer. Robinson was still on a bad footing with the lieutenant governor when a paralytic attack on 23 June left him “deprived of the use of his left side.” Seeing no prospect of Robinson’s recovery, Head demanded his early resignation from the Crown Lands Department and, in order for its business to continue, offered the position to Robert Baldwin Sullivan*. Robinson closed his books as commissioner for crown lands and for clergy reserves on 1 August but seems to have continued as nominal surveyor general of woods until 9 May 1837. Robinson wrote his will that month on the realistic assumption that most of the land he had acquired privately would have to be sold to cover his accounts. A list of his lands in 1837 recorded more than 7,592 acres and a couple of additional properties in Toronto. Printed family records say that Peter died unmarried, but two children, Isabella and Frederick, were his main concern in his will. After his death in July 1838, John Beverley Robinson supervised an arrangement whereby Isabella moved to Whitchurch Township to board on the farm her father had given her, with Frederick joining her in the school holidays. The plans for immigration which Wilmot-Horton introduced would have been dangerously theoretical without Peter Robinson. He provided the local knowledge and practical good sense missing from many 19th-century colonization schemes. Robinson also brought an unusual amount of first-hand experience to the job of commissioner of crown lands. So long as the emphasis was on opening the province by making land available to actual settlers, his priorities were right. Once attention shifted to the administration of his office, he appeared old-fashioned. As John Beverley Robinson feared, Peter’s lack-lustre performance in York overshadowed his achievements. Robinson is remembered for Peterborough, but not for his sustained interest in promoting the settlement which helped to shape many other parts of the province. AO, MS 4; MS 524; RG 1, A-I-4, 2; A-I-6, 7–11; RG 22, ser.155. Derby Central Library (Derby, Eng. ), Catton Coll., Sir R. J. Wilmot-Horton papers. PAC, RG 5, Al, 59–75, 137–60; RG 68, General index, 1651–1841: 430, 670. PRO, CO 42/415–16 (mfm. at AO); CO 384/12–13 (mfm. at PAC). G.B., Parl., House of Commons paper, 1826, 4, no.404: 1–381, Report from the select committee on emigration from the United Kingdom; 1826–27, 5, no.550: 225–882. Third report from the select committee on emigration from the United Kingdom, 1827. Town of York, 1793–1815 (Firth); 1815–34 (Firth). The valley of the Trent, ed. and intro. E. C. Guillet (Toronto, 1957). R. J. Wilmot-Horton, Ireland and Canada; supported by local evidence (London, 1839). D. H. Akenson, The Irish in Ontario: a study in rural history (Kingston, Ont., and Montreal, 1984). Wendy [Stevenson] Cameron, “Wilmot Horton’s experimental emigrations to Upper Canada: his management of the emigrations and his evaluation of the prospects and progress of his settlers” (b.litt. thesis, Univ. of Oxford, 1972). H. I. Cowan, British emigration to British North America; the first hundred years (rev. ed., Toronto, 1961). Gates, Land policies of U.C. H. J. M. Johnston, British emigration policy, 1815–1830: “shovelling out paupers” (Oxford, 1972). E. A. Mitchell, Fort Timiskaming and the fur trade (Toronto and Buffalo, N.Y., 1977). C. W. Robinson, Life of Sir John Beverley Robinson, bart., C.B., D.C.L., chief-justice of Upper Canada (Edinburgh and London, 1904). W. R. Smith, “The early development of three Upper Canadian towns,” York Univ., Dept. of Geography, Discussion paper (Toronto), no.16 (1977). [Ethel Willson Trewhella et al. ], History of the town of Newmarket (n. p., [1968?]). Alan Wilson, The clergy reserves of Upper Canada: a Canadian mortmain (Toronto, 1968). Wendy [Stevenson] Cameron, “Selecting Peter Robinson’s Irish emigrants,” SH, 9 (1976): 29–46. J. B. Gilchrist, forthcoming article, Families (Toronto). Wendy Cameron, “ROBINSON, PETER,” in Dictionary of Canadian Biography, vol. 7, University of Toronto/Université Laval, 2003–, accessed April 19, 2019, http://www.biographi.ca/en/bio/robinson_peter_7E.html.